We always love to highlight awesome vendors! We found an amazing wedding dress shop located right here in Greenville, SC! Dimitra Designs offers beautiful wedding dresses, as well as bridal accessories, formal shoes and dresses for the mother-of-the-bride , bridesmaids, and flower girls. Dimitra Designs is an authorized dealer for quality bridal dress brands, so you know that you’re getting the real thing! Dimitra Designs is more than just a local shop catering to stunning bridal fashions. They also cater to online customers at DimitraDesigns.com for all of your bridal needs, as well as catering to prom, pageants and quincenearas! The Dimitra Designs shop is located right on 303 N Pleasantburg Drive, just across the street from Krispy Kreme! Check out their shop for the latest bridal dress styles in Greenville and the upstate area. They also have amazing wedding dress consultants to help you make your choice! If you are too far away to drive here, check out their site for even more of the same great fashions! Become a fan on Facebook too! Get your wedding dress from Dimitra Designs and receive $100 off any of our wedding packages! Get any other dress from Dimitra Designs and receive $25 off any photo session! Specials expire Nov 1 2011. 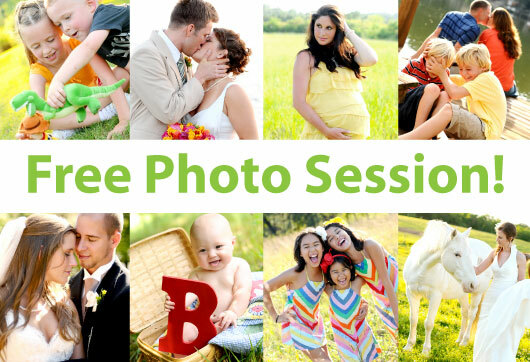 We are giving away a free photo session! To participate, all you have to do is ‘tag’ or ‘mention’ the Davey Morgan Photography Facebook Page in your status update. Note: To ‘tag’ us, you must be or become a fan of Davey Morgan Photography. Type anything you want about Davey Morgan Photography and type the @ symbol, then start typing Davey Morgan Photography and pick it in the drop down box. Posted in Special Offer | Comments Off on Free Photo Session Contest! Do you want to give someone a special and unique Christmas present this year? Surprise a friend or family member with a photography gift certificate! You can also get a gift certificate for a birthday, anniversary, Valentine’s Day or just for fun! We offer gift certificates for all of our photo sessions including, family, baby, senior, maternity, couple, weddings, and anything else you can think of! We can also include print credit for ordering prints and englargements! We can customize the appearance of the gift certificate to fit any ocassion. Give us a call at 864-378-2248 or e-mail us at info@daveymorgan.com/blog is you are interested in buying a gift certificate or have any questions! *Gift certificates are available for any monetary value between $20 and $1,000 and for any portrait, wedding, etc. session. That means that you can give someone twenty to one thousand dollars towards any of my packages! **Gift certificates cannot be used to purchase canvases, prints, photobooks, etc., unless already included in the package. Posted in Special Offer | Comments Off on Special Christmas Present! You are currently browsing the archives for the Special Offer category.